From 18-22 October 2018, lessons were held by Professor Zigmunt Vetulani of the Adam Mickiewich University (Poznan, Poland), Faculty of Mathematics and Computer Science, Professor of Computer Linguistics and Artificial Intelligence at Urgench State University, Department of Physics and Mathematics, Vocational Education: Informatics Foreign professors were highly applauded at the highest level, and on October 18-22, 2018, all conditions were created for the students to conduct a high level of classroom work. The students were very interested in the training of foreign specialists. Also, meetings were held to direct students, masters and young teachers to scientific research. The prospects of collaboration with Adam Miskiewich University were discussed for future academic and scientific purposes, training of graduate students, young teachers and researchers, organization of retraining and professional development of professors and teachers, and creation of new generation educational academic courses. 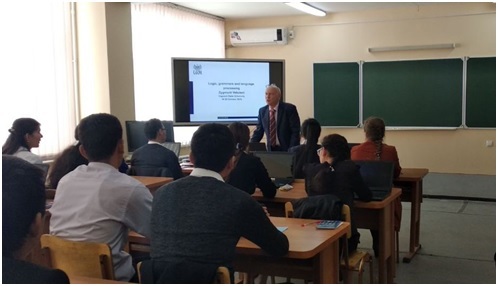 The meeting on the monitoring visit for the project has been implemented by Aziza Abdurakhmanova, the NEO coordinator on 2 November 2018 at National University of Uzbekistan (NUUz). In this meeting it was reported about the short-term training and meeting with the professors invited from AMU partner university regarding to the Computing Linguistics course in the framework of the CLASS project.The meeting with the professors from AMU partner impacts to the rising the number of interested students and the professors to the field as it was expected from the implementation of the project activities.